In this article we are going to add legends to choropleth map with topojson Data using leaflet. Legends are the element of map that provides information about map with the help of symbols. Here symbol can be colour, shapes, figures etc. The choropleth map gives information using colours. 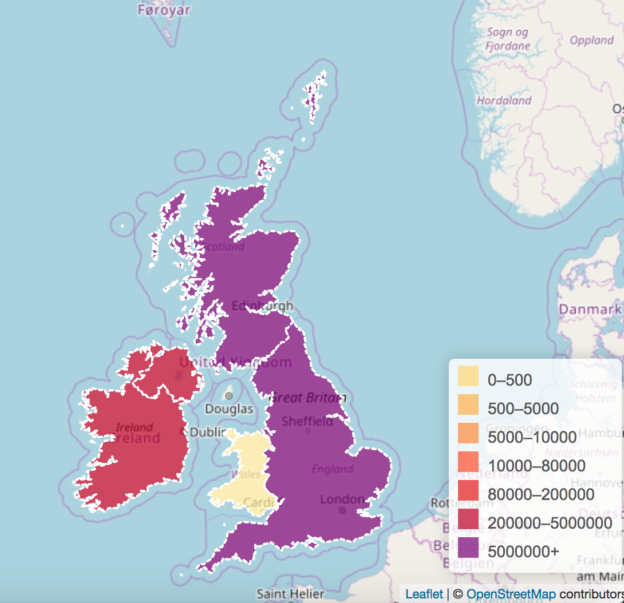 Lets play around with : Create beautiful Legend map – leafletjs topojson. If you are very new to Leafletjs then before going through this article you should look over to Getting started with Leafletjs article and how to render topojson with leaflet js. To add field and colour in legend on map, a for loop has written. This shows variable i has initial value as zero and condition is as, “if variable i is less than length of array grades then loop will run and after one cycle increment will take place”. HTML element div has styled inside loop having background colour values from getColor() method and &ndash is HTML entities used for typography. Here is how the output will look like. I had taken UK topojson file. If you have shapefile to geojson or kml file, you may look over to an article to convert shapefile to TopoJson or Geojson to Topojson Conversion. If you have Kml file then you can convert the kml file to Shapefile and then to TopoJson file. This will finally make you to create dynamic legends with leafletjs library in Mapping system. I hope article helped you. If you find any problem in creating dynamic legends, do comment below in the box provided, we will discuss and solve the issue.